For the first time, in all the flights I booked online with Cebu Pacific, I made an error in filling out one of the more important details – the passenger name. Ack! And if the same thing happened to you and like me, you found out the mistake after verifying your credit card details, chances are, you felt a lot like I did. It was a silly mistake but I did have my reasons. I was in a hurry to get the flight booked. You see, the first attempt I booked for this flight, Cebu Pacific’s website gave the error prompt and I had to do the process over again. When the blanks were filled in for me on my next attempt, I was careless and did not double check and only made sure I got our travel dates right. The day the hubby acquired my middle name. My bad! While I could have panicked and worried that I might have to buy a separate ticket for the hubby again and end up wasting money, I collected myself and called the Cebu Pacific hotline 702-0888. Turned out Cebu Pacific actually has allowance for this particular silly mistake that some of their passengers are bound to make at one time or another. 1. Go to http://www.cebupacificair.com/Pages/fee-summary.aspx 2. Scroll down to Name Change Fee – (NC) 3. 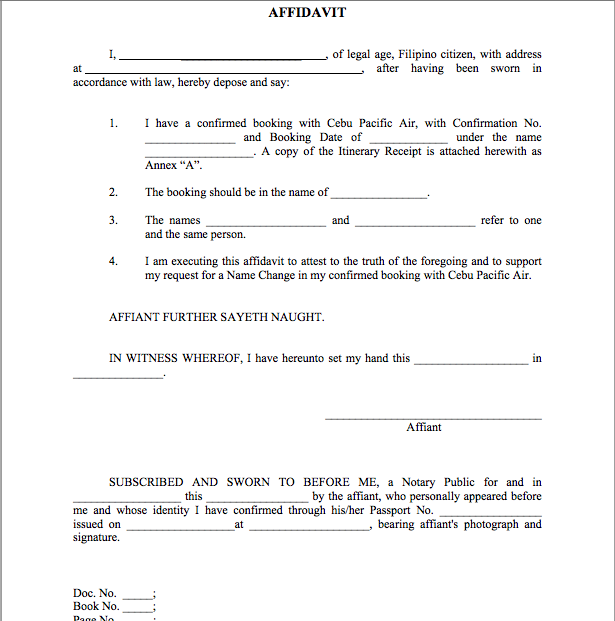 Click on the pro-forma affidavit (name correction of same person) 4. Have the form printed and filled out (no need to have it notarized) 5. Email namechange@cebupacificair.com with the Booking Reference No. as Subject. Attach with the email the scanned copy of the filled out Pro-forma Affidavit and the scanned government issued ID of the passenger. Indicate within the email the travel dates. Chelsea said that upon submission of the needed requirements, I can follow up with them after 24 hours. Turned out I did not need to follow up with them since I received a reply and an itinerary receipt with the hubby’s name corrected in less than three hours. Thank you for sharing your experience with Cebu Pacific name change. It was perfect solution to my predicament. pa help nmn kc nagkamali ako ng input ng JR…dpat ang JR nasa kasunod ng first name pro ang nagawa ko ung JR nasa surename ko nailagay…ano dpat ko gwin pra maaus? Hello po! Need help po, Ang friend ko ang nag book ng flight q this morning lang, then she send me the booking reference for me to pay without knowing na mali pala yung apelyedo q. Instead na Christine Panganiban only appear as Christine Pa. Anu po ba dapat gawin aside sa tawagan ang hotline nla? Wla po ksi kming landline eh. Thank you po! More Power! Year 2016 month of May and I end up on this blog because I too did a mistake. An friend ask me to buy her a one way ticket from Taipei to Manila. I key-in her surname instead of her family name. I was so stressed with the mistake and scan through CEBU PAC website for solution. It was an international call and I dialled many times and waited for two minutes at a time until I hang-up and called again and for seems eternity someone replied. so there hotline would be available 24 hours a day in a quick response. Anyway the one who answered the phone told me to prepare two documents . There was no Pro forma Affidavit required. Now my problem is , my friend didnt have her MC so right now I am sending Cebnamechange mail if I can use another Identification that will show three names . Family name, First Name, and Surname. It was this ID that I got confused that I key-in the first name and surname. Still waiting for reply . Hi! 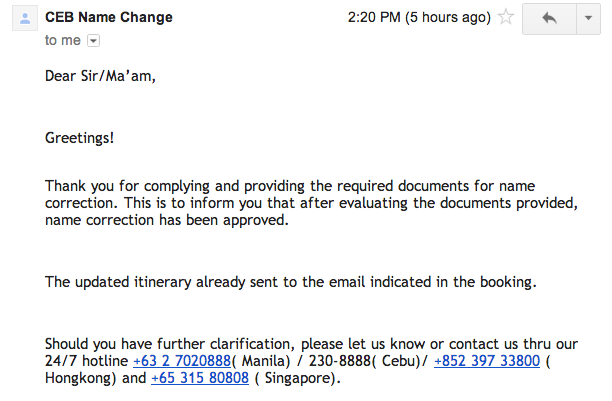 Was the email cebnamechange@cebupacificair.com given to you? Have they replied to you yet? I am in the same predicament at the moment and waiting for a reply. Hi! Need help. Since i cannot call the hotline,might as well ask here. What if there was a missing letter in the name. Like lacking “n”. My 6 mo. son is Siegmunnd,and my aunt input Siegmund which contain one “N” only. What do I do? Please help me po ngayon ko lang na check na mali ang na encode ko sa name ni PERIWENKLE CASTA . nagkamali ako na insted PERIWENKLE, PERIWINKLE sana OR Instead of WE dapat “WI”. Gamit ko Credit Card ko para ito sa pamangkin ko na ang flyt ay sa April 15 @ 3:15 PM Manila to Roxas City. Please po tulungan nyo naman ako na e consider, clerical error lang po. Hi I need help I booked the ticket for my daughter but I was wrongly type the last name..It is supposed FAZRINA SHAREEN SHEIKALIE not SHEICKALIE..Hoping for your kind and immediate respond regarding this matter. Thank you..
Hello..i need help.have some error in my itinerary.i call the customer service many times but no one answer..my problem is all about my name in my itinerary it was belenda olivarez prado…instead of belenda prado olivarez is the correct..pls help me..it doesn’t matter when i check in? Last December 26, 2016, I booked a ticket for my 2 sisters and myself. One of my sisters names was misspelled. I typed MA NELLA TAN instead of MARIA NELLA TAN, which is the name in her passport. What do I do to correct our ticket. Please advise asap. Thank you very much. tatangpin po ba ang greencard niya? sa passport niya kasi is family name namin bahian pero nalagay ko po ay nelson last name ng asawa niya. sa greencard po nag appear yung nelson kaso sa passport niya is bahian. please po need advise. flight ref number po ay LDRZMD. pwede po ba palitan ng apilyido? I have failed filling out my middle name does this matter? My flight details doesn’t match my passport due to locking of my middle name.Please help me. Thanks! Pa help pls..my frnd ask me to book his sister a ticket and i was mistake typing her surname.. what will i do? hi, so sorry but i book a flight for the three of us..my daughter and my mom whose age is 73, but sadly she cant make it on saturday flight so i tried calling the customers hotline to help me book a trip for a regular fare inbehalf of the slot of my mom for my cousin,but i was confused how come they book me the same name of my mom insted of my cousin?pls help me…..
My name was miscorrectly spelled. From Emelie to Emelia..What should I do? please change the surname of my wife:s name from Fe Alma Durs to Fe Alma S. Durano our flight is on Sept 4, 2017 with Booking Reference no W7W9WL. Thank you very much for your kind assistance,..
hi mam please help me also dahil nag kamali yong boyfriend ko pag sulat ng pangalan ko instead of Leil ,ni lagay niya duon ay Liel yun lang ,may problem pa ba jan? hello.. pano po if ever nag kabaliktad and surname sa first name.. japanese kc sya kaya lagi po nauuna ang last name kaya nag kamali po sya ng book my ways pa po ba maayos?